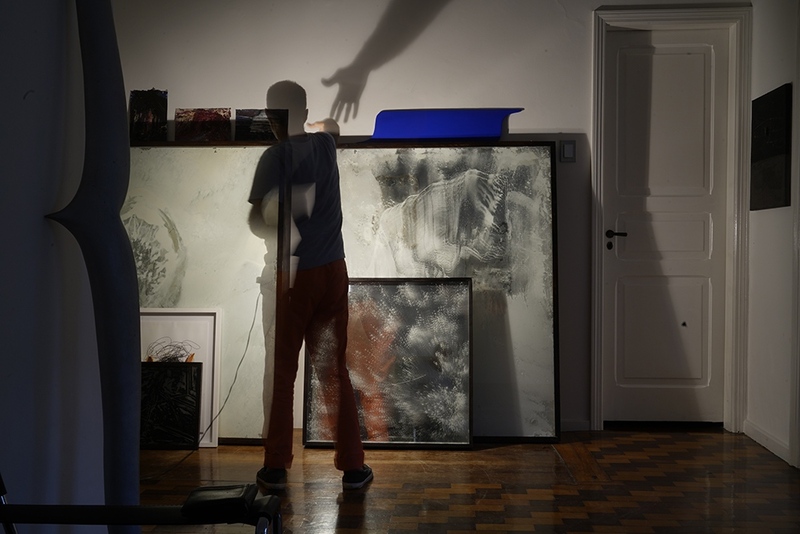 Rodrigo Oliveira working at his studio in Lisbon, Portugal. 2014. This image was made with color film with a Fuji GW690 III camera, in 6x9 format. 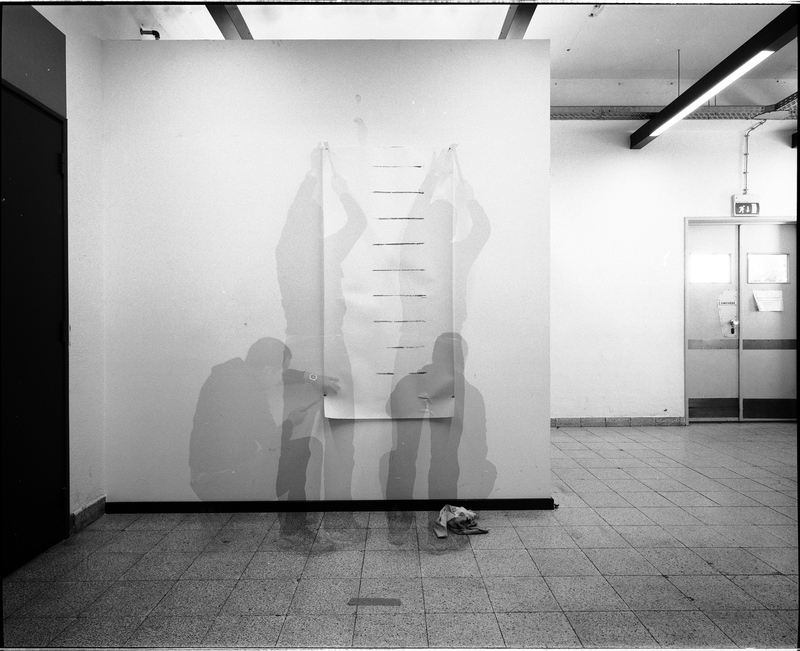 It was scanned by the artist with Hasselblad flextight X1 professional scanner. This has a edition of 6 + 3 PA in the size 75x110 cm. It is printed by the artists in archival quality. After the first experiences with Peter Kogler in 2009 and in 2010 with Sabatier and Art and Language ( with Mel Ramsden and Michael Baldwin) the project started with Portughese artists, mainly in Lisbon. 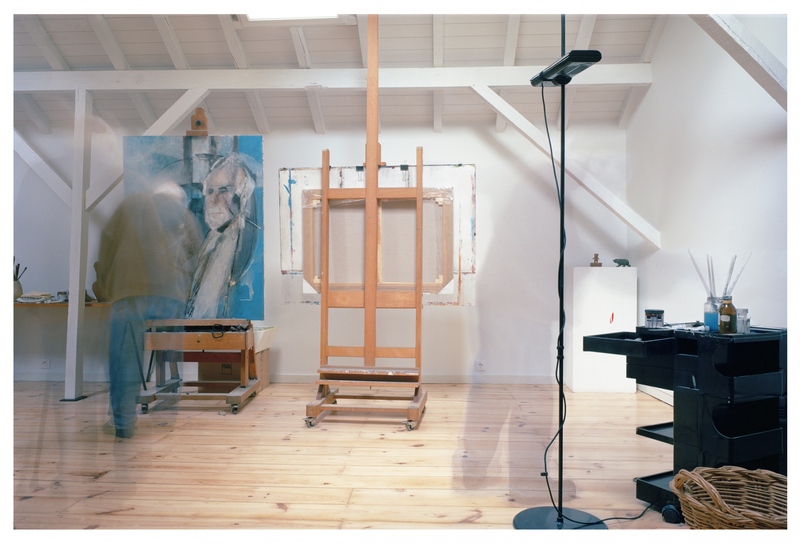 Júlio Pomar painting in his Studio, Lisbon, Portugal. 2014. 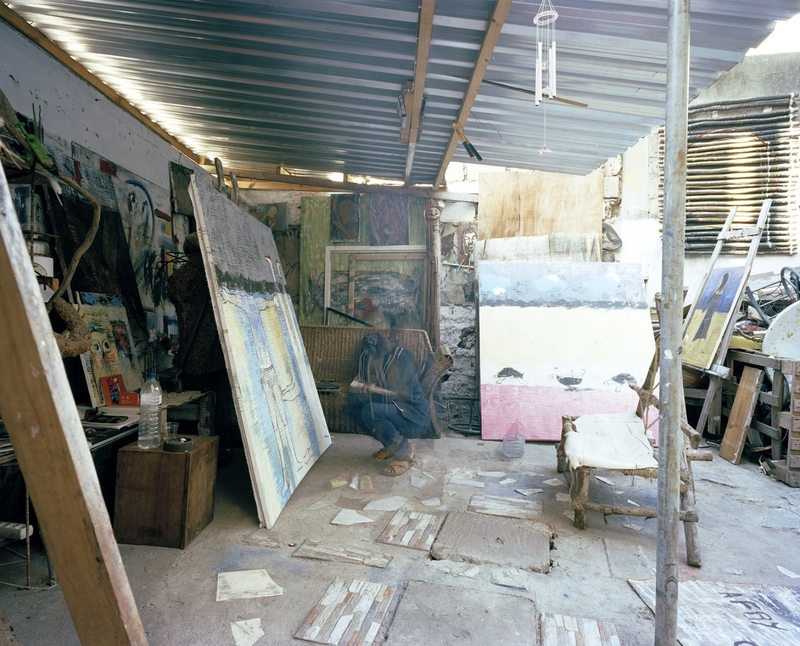 His studio was renewed to be spotless, he told me that it was better before. He died this year, 2018, with 92 years. 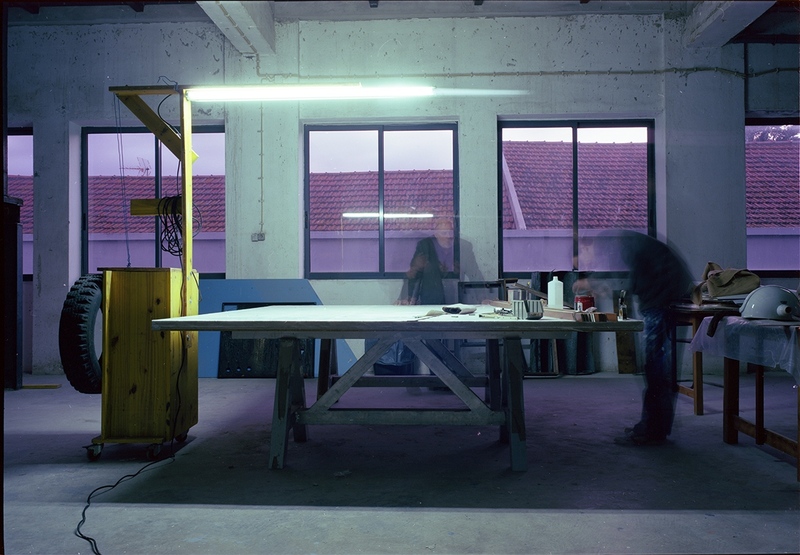 Albuquerque Mendes at his studio in Leça da Palmeira, Porto, Portugal. 2017. Spaces is a long term project started in 2009. It is about the creative moment. 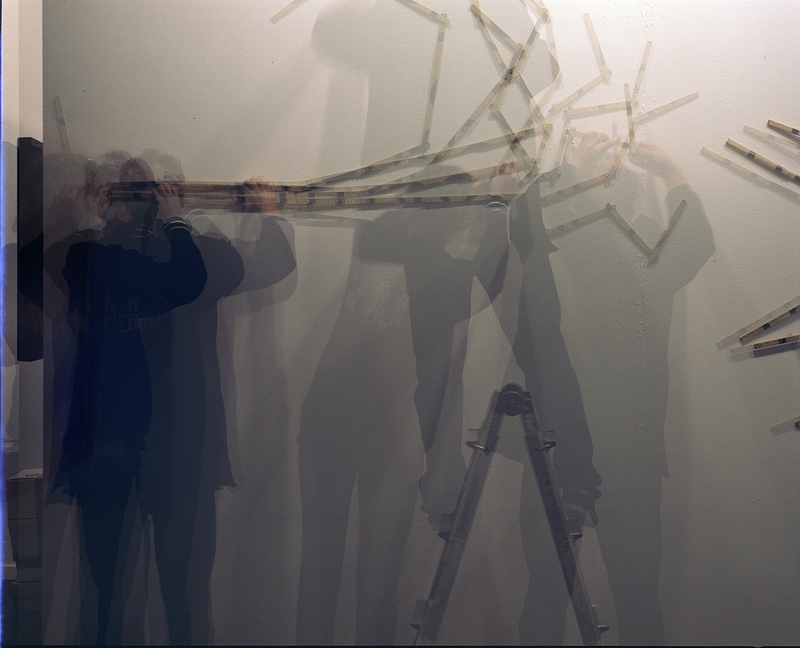 Artists are working but it is not always possible to really see what they are doing. Sometimes they are photographed in a way that they look like ghosts while all space is well fixed. In this project the artists are universal, they don't seem to have color, age, of even a proper shape. All they have is a Space to work. I photographed more than 50 artists from Portugal, France, Cameron, Mozambique, Angola, Brasil, England, Austria and from Spain, i visited studios in Brasil, Mozambique, Portugal and Spain. 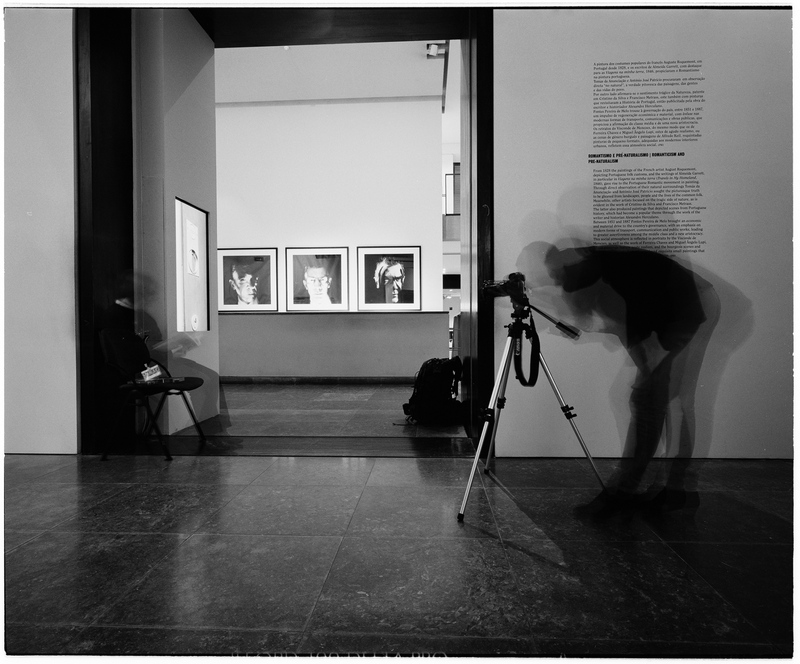 I made solo exihbitions in major museums like Centro Cultural de Belém (in Berardo Museum), Centro Cultural de Cascais ( black and white only), Museu Nacional de Évora, Galeria Trem and Chiado8. The next exhibition will be Centro Camões in Maputo, Mozambique (open 21 Nov. 18). 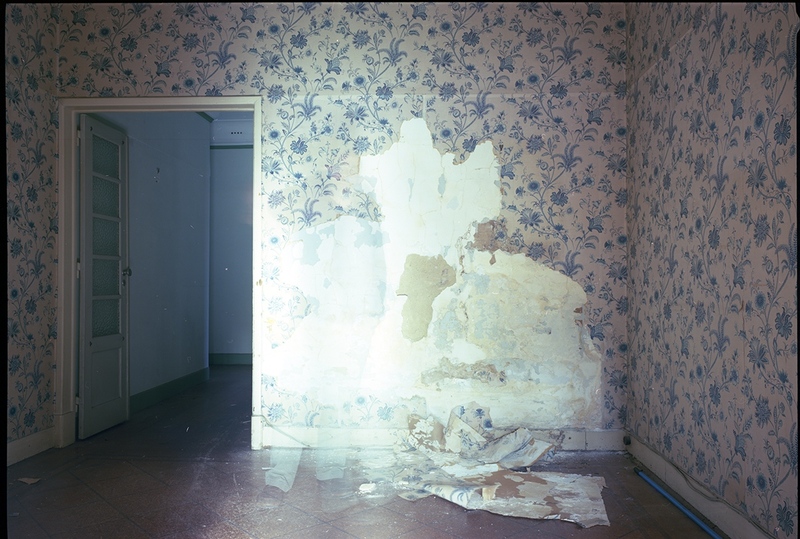 In this project I used primary medium format film (6x7, 6x9 and 6x17), both in colour and in black and white. Some digital images are used as the quality in digital photography increases. 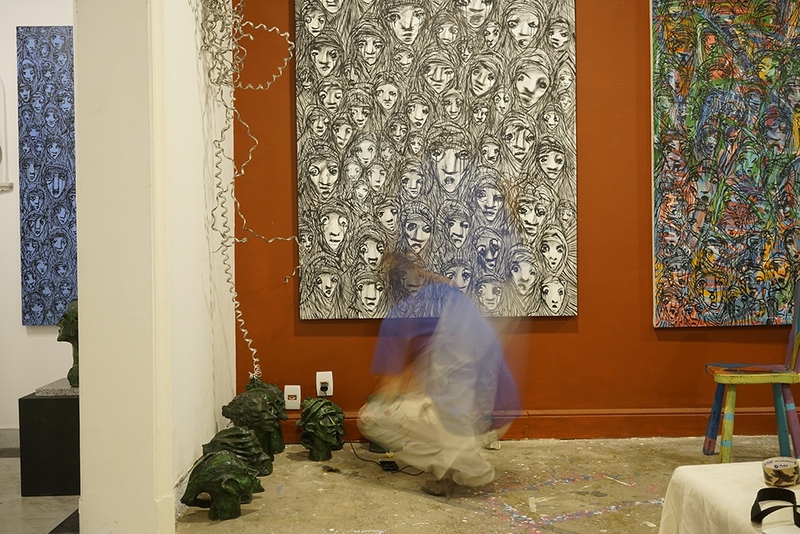 As much as possible, all stages of the work are made by the artist. All prints have limited editions. Orlando Franco at work in the streets in Marvila, Lisbon, Portugal. 2014. Orlando Franco at work in the Studio, Lisbon, Portugal. 2014. 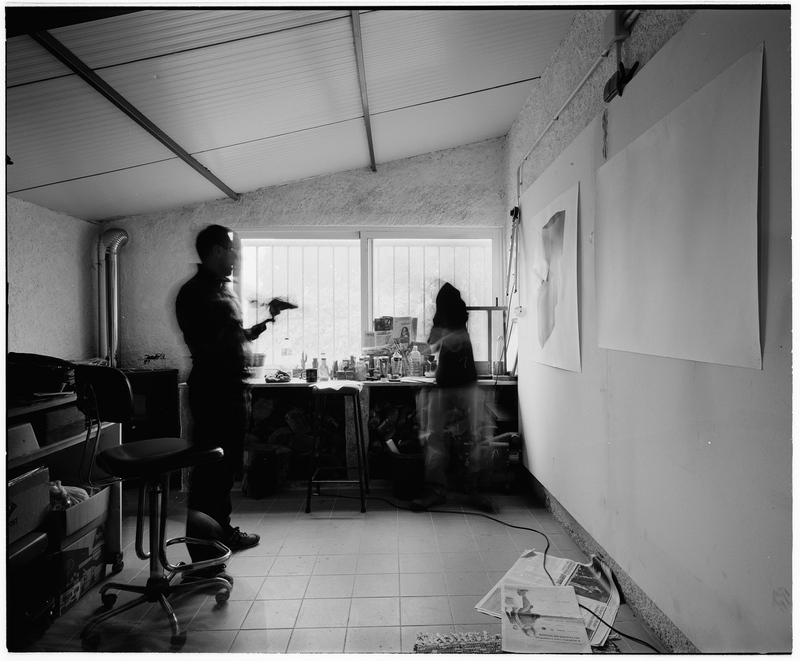 Yonamine Miguel with his assistent, working in a two hand paintings with Sofia Pidwell, for an exhibition at Museum Arpad Szenes Vieira da Silva. 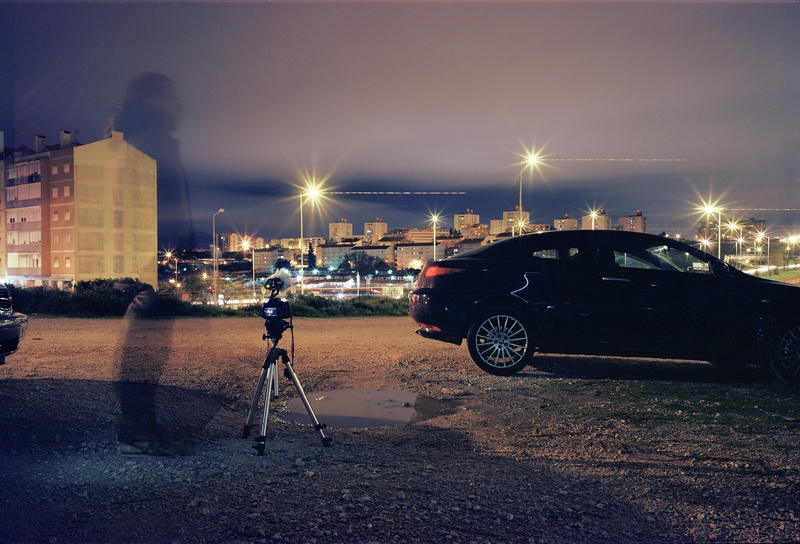 They where working at ZDB galery at Lisbon, Portugal, 2014. 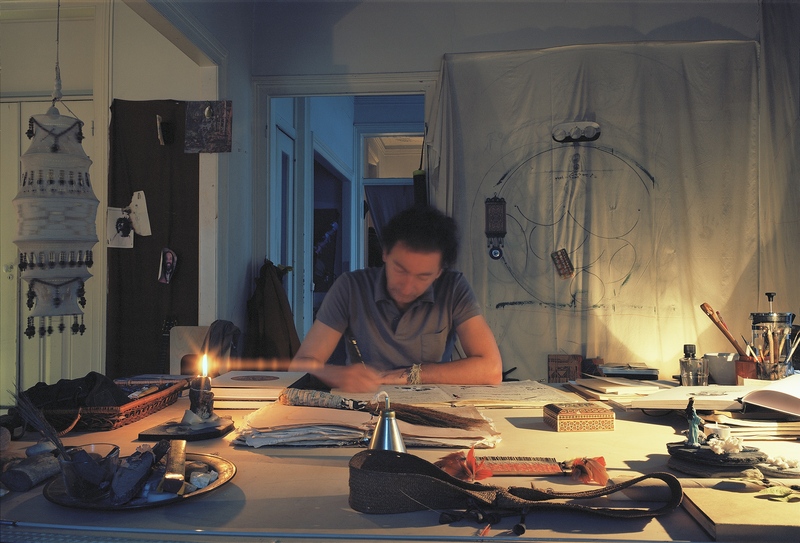 Pedro Cabrita Reis working in his Studio, Lisbon, Portugal. 2014. 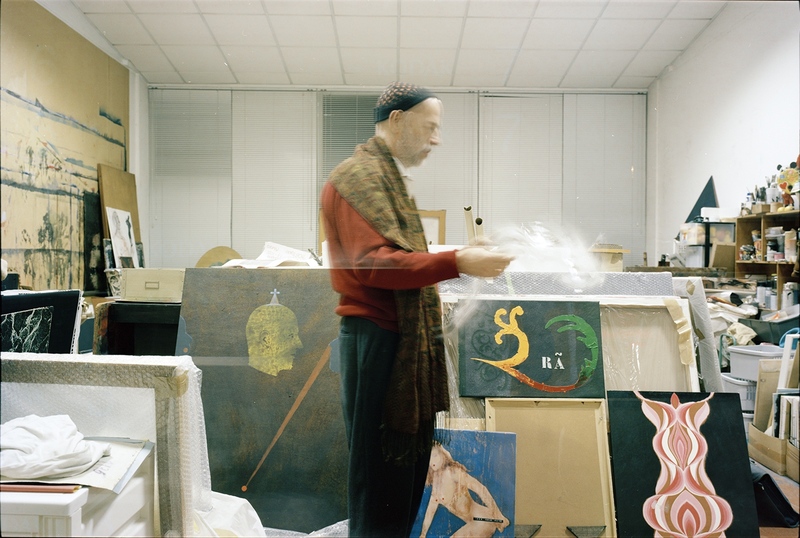 Antonio Poppe working in his Studio, Lisbon, Portugal. 2014. 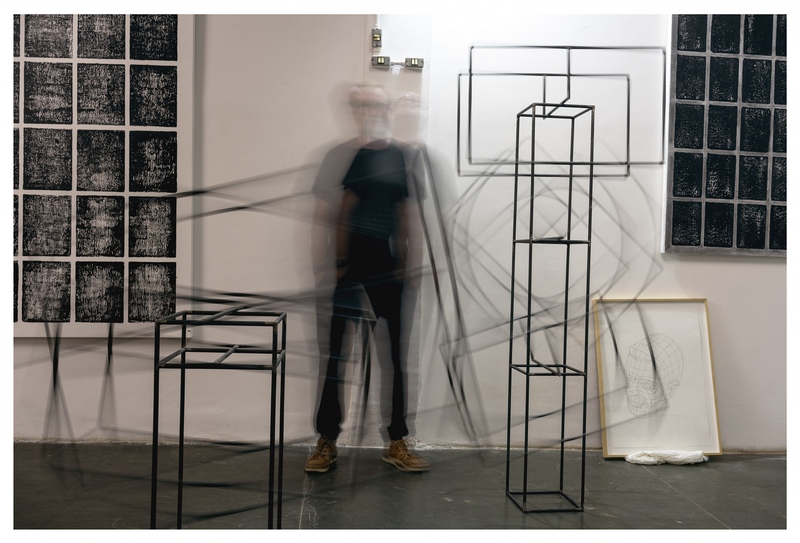 Miguel Palma, in the fist day at his new Studio in, Lisbon, in 2014. He renew the space but when the contrat ended the owner asked him almost the double of the price that was already very hight. He left to other space. With some visits to Maputo, I started the project in Mozambique. I photographed José Forjaz, Gonçalo Mabunda, José Cabral, Janete, Famoz, Butcheca, Felix Mula and Mauro Pinto. 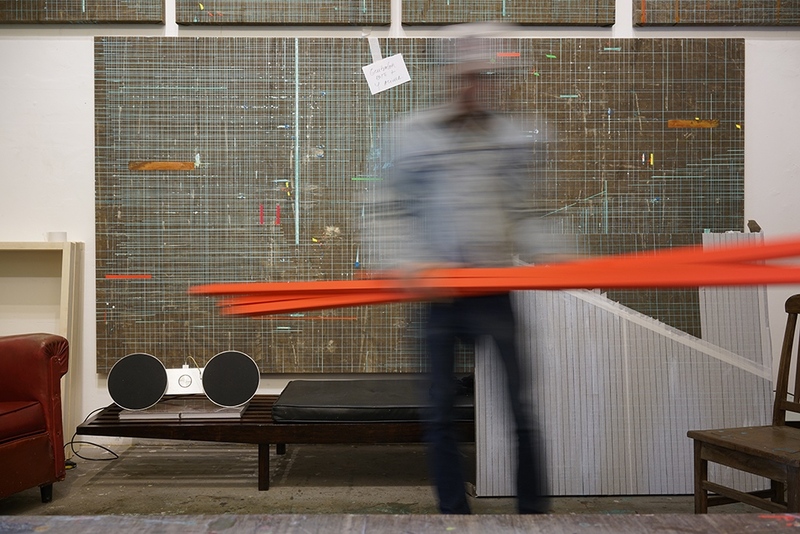 Gonçalo Mabunda working at his studio in Maputo, Mozambique. July 2016. 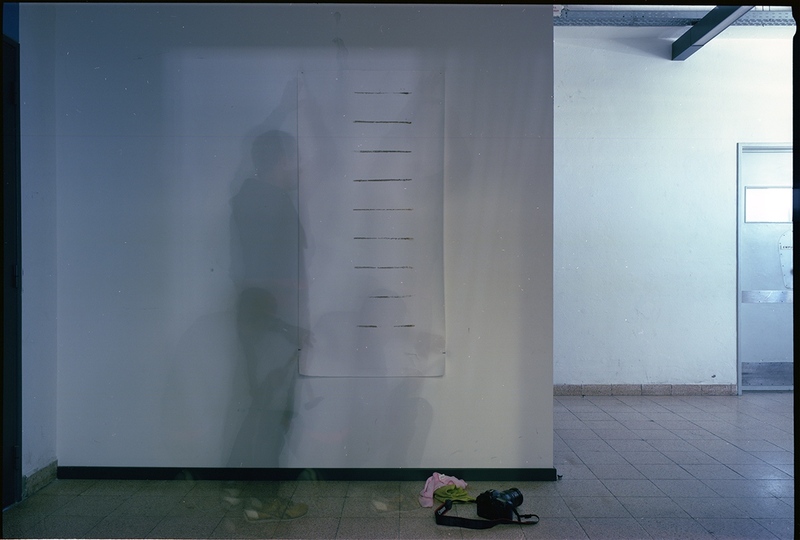 This image was made with color film with a Mamyia 7II camera, in 6x7 format. This has a edition of 6 + 3 PA in the size 75x94 cm. Janete improvising, Maputo, Mozambique. July 2016. 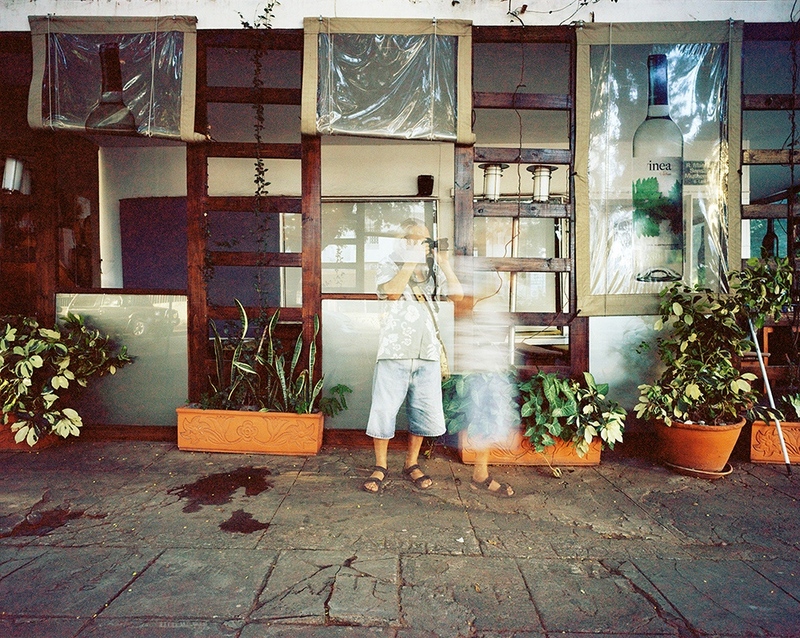 José Cabral photographing in the street, Maputo, Mozambique. July 2016. 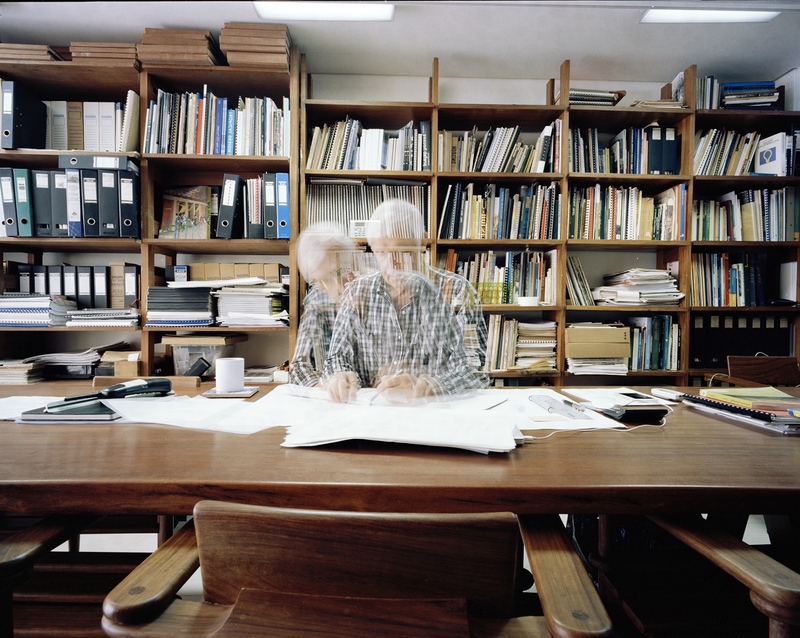 The architect José Forjaz working at his studio, Maputo, Mozambique. July 2016. 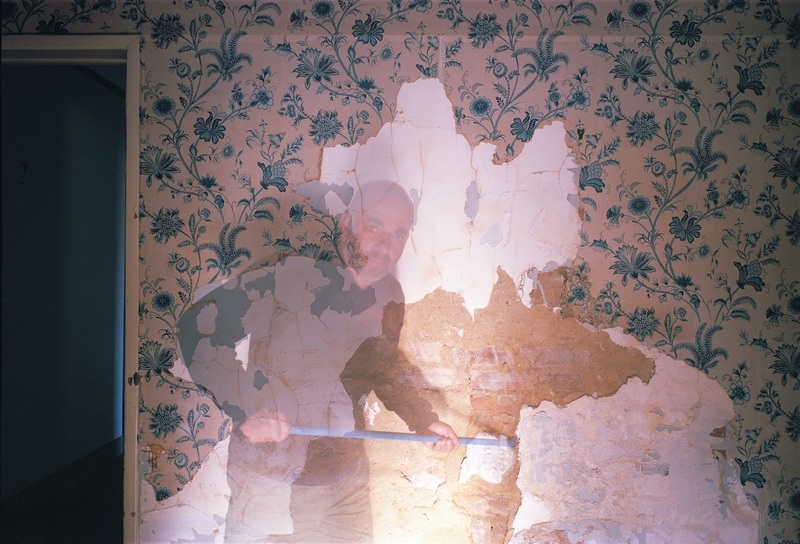 This image was made with color negative film with a Mamyia 7II camera, in 6x7 format. 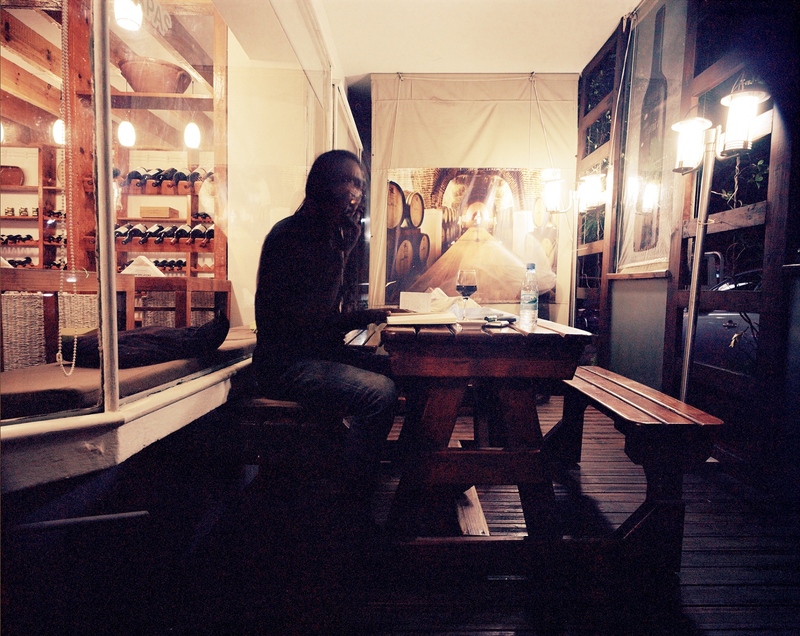 Felix Mula working in a cofee table, Maputo, Mozambique. July 2016. 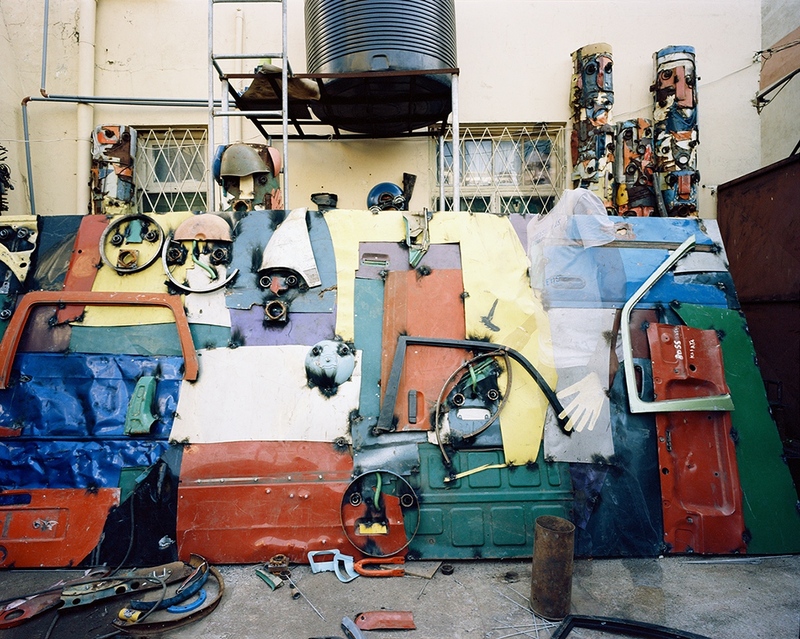 Butcheca painting at his studio, Maputo, Mozambique. July 2016. With a artistic residence, ofered by Miguel Sayad with Espaço Vazio, I started to meet brazilian artists in Rio de Janeiro, in 2017. Raul Mourão at work in the Studio, Rio de Janeiro, Brasil. July 2017. This image was made with digital camera Sony a7R2, with 42Mp. Deise Xavier in the Studio, Rio de Janeiro, Brasil. July 2017. Sergio Mauricio at work in the Studio, Rio de Janeiro, Brasil. July 2017. 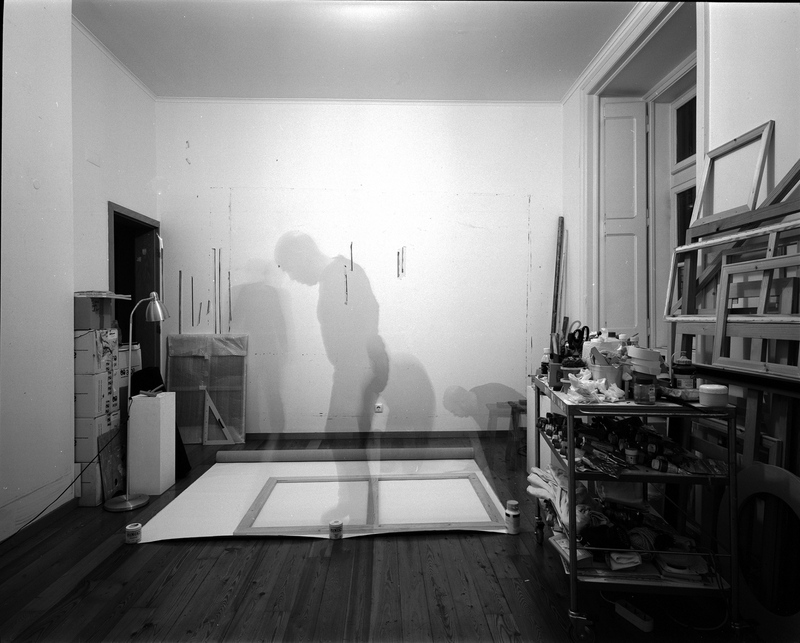 Jorge Barata finishing one painting in the Studio, Rio de Janeiro, Brasil. July 2017. Gabriela Machado at work in the Studio, Rio de Janeiro, Brasil. July 2017. Ricardo Becker at work in the Studio, Rio de Janeiro, Brasil. July 2017. 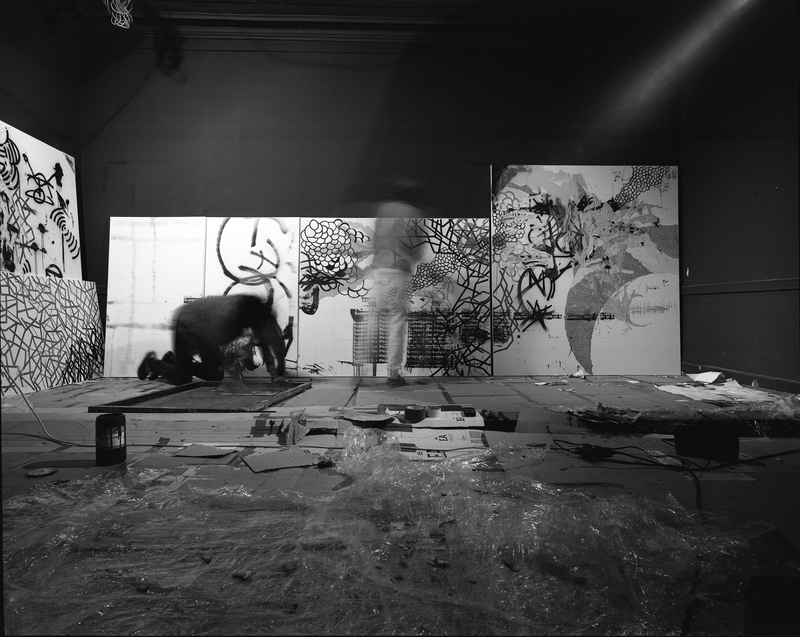 José Bechara at work in the Studio, at that moment he was preparing a major solo exhibition at MAM, Rio de Janeiro, Brasil. July 2017. 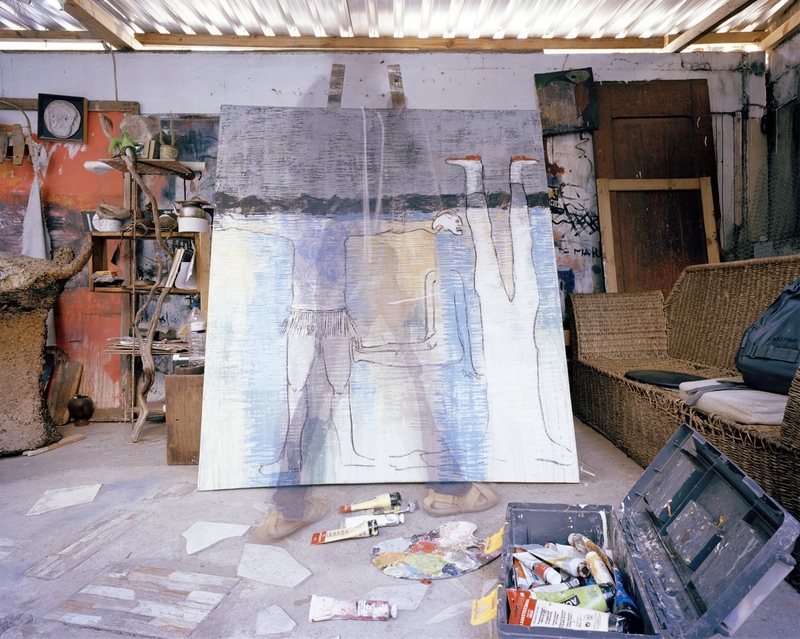 Carlos Vergara at work in the Studio, Rio de Janeiro, Brasil. July 2017. 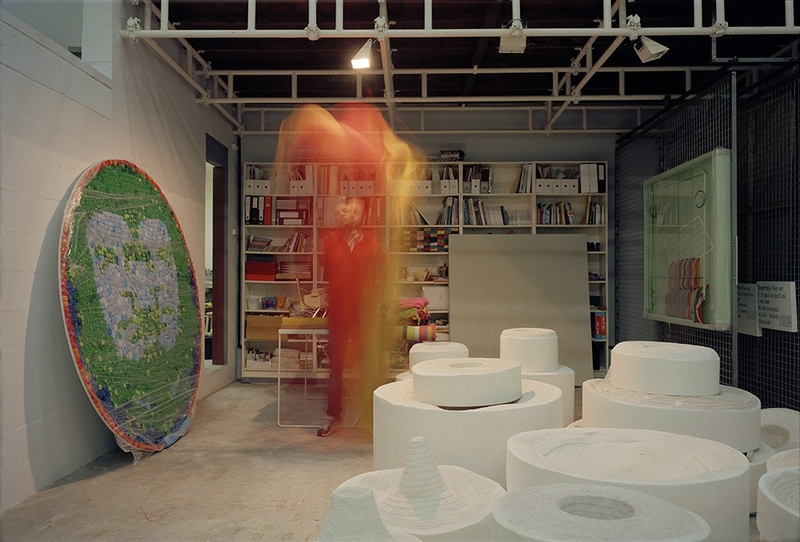 Demian Jacob at his new Studio, preparing a new photo book, Rio de Janeiro, Brasil. July 2017. 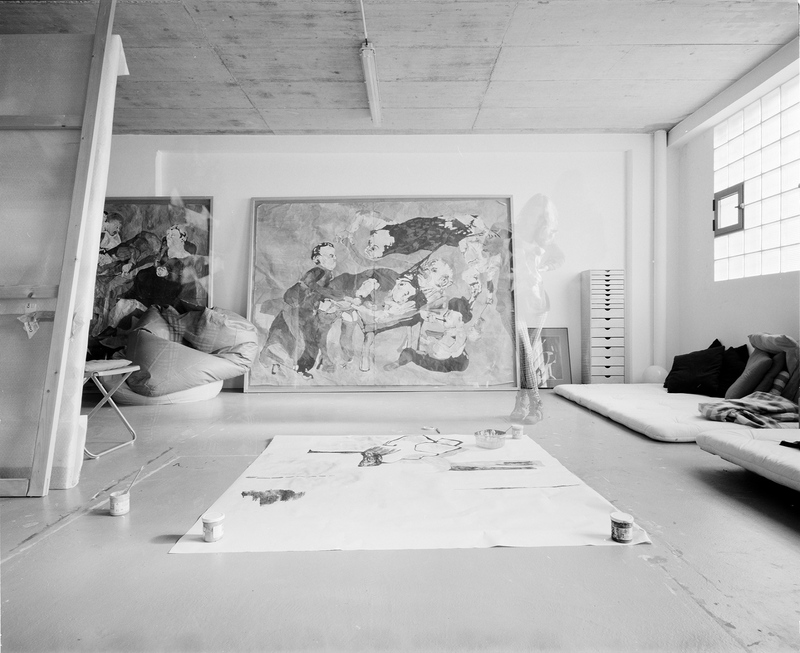 Rene Machado at work in the Studio, Rio de Janeiro, Brasil. July 2017. 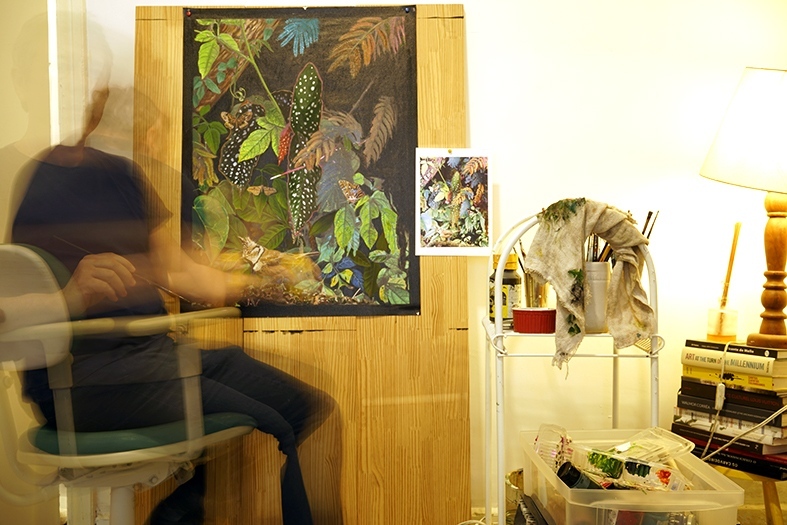 Monica Barki at work in the Studio, Rio de Janeiro, Brasil. July 2017. 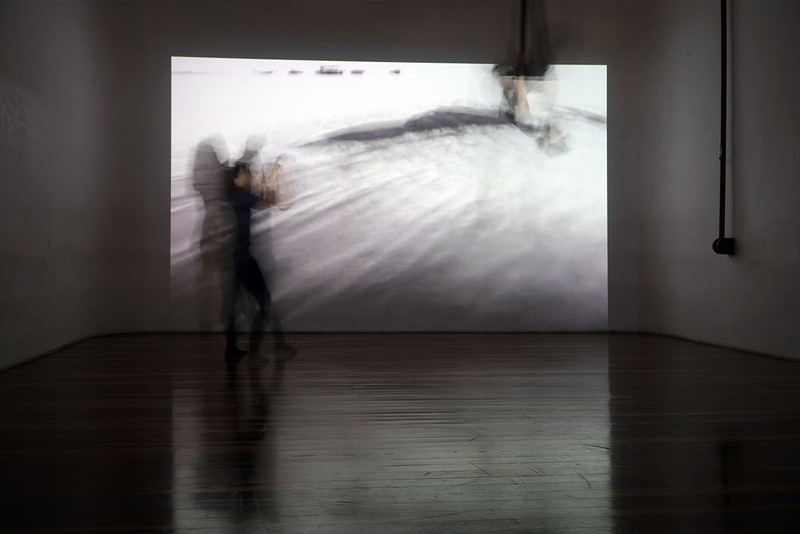 At that time Monica had a great solo exhibition "Eu me declaro", at Paço Imperial, in Rio de Janeiro. Liana Nigri at work in the Studio, Rio de Janeiro, Brasil. July 2017. Rona at work in the Studio, Rio de Janeiro, Brasil. July 2017. Maria Baigur at work in multimedia Studio, Rio de Janeiro, Brasil. July 2017. 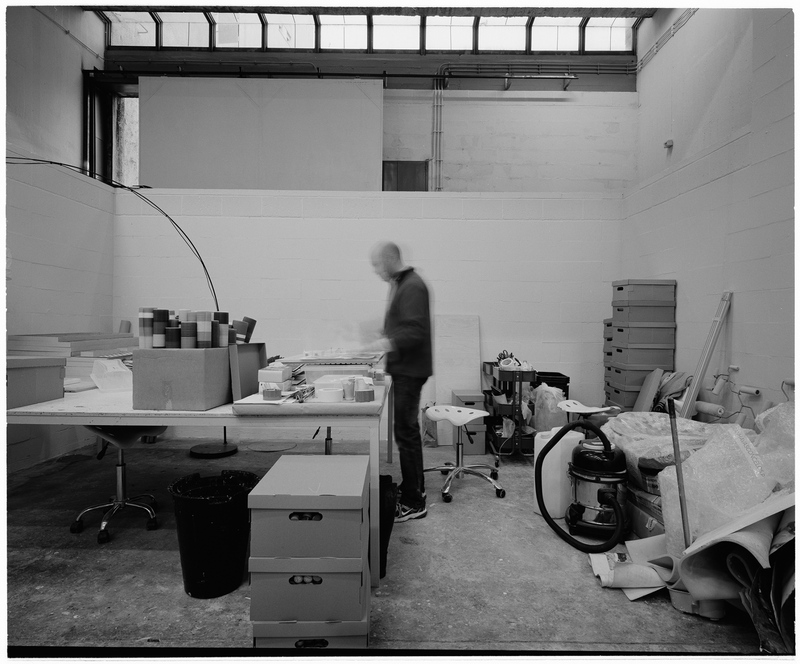 Graham Gussin working in CGAC, Centro Galego de Arte Contemporânea, Santiago de Compostela, Spain. 2014. The artist was invited by Miguel von Hafe Pérez , the former director and curator, to present a paint on a wall of the museum for the Exposition 93. 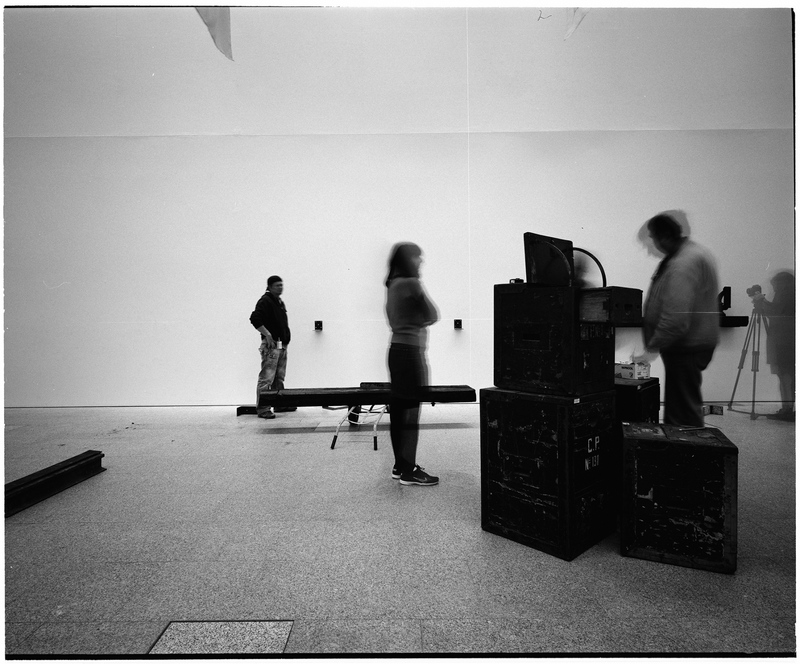 Eugenio Ampudia installing his work at ARCO, in Madrid, Spain. There are some black and white images. 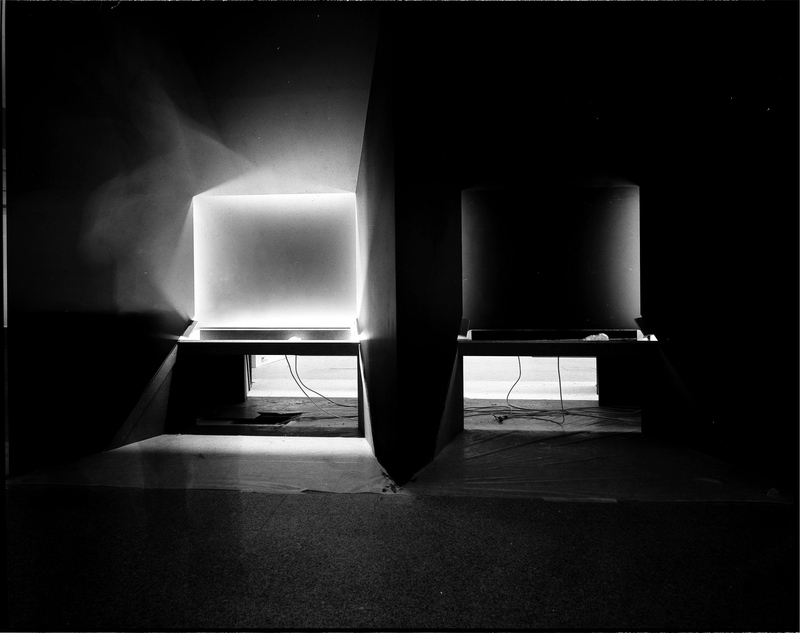 These where made with Mamiya 7II in 6x7 format. 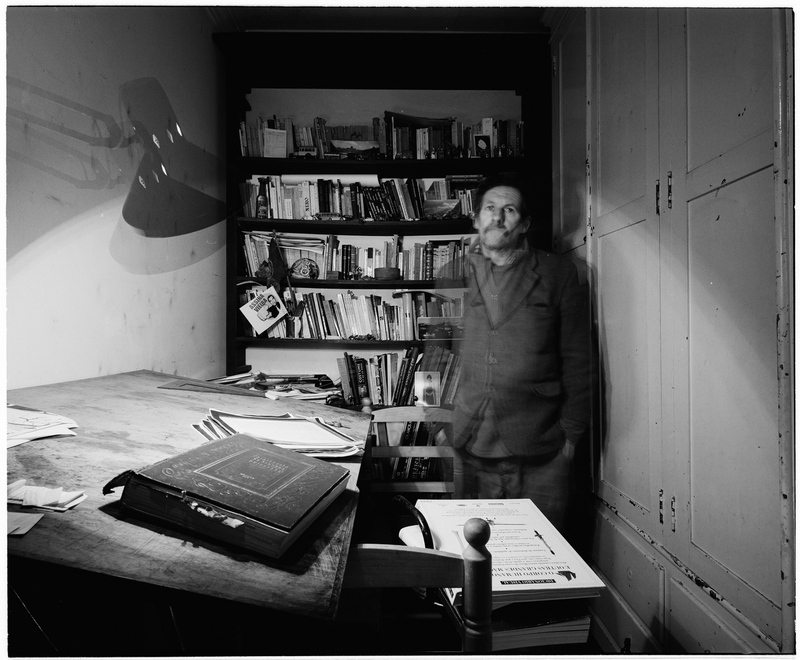 Julio Pomar in the studio, Lisbon, Portugal. In 2014. This image was made with black and white film and Mamyia 7II camera, in 6x7 format. This numbered copied was processed in Ilford FB glossy paper, 50x60cm. Rodrigo Oliveira in the studio, Lisbon, Portugal. In 2014. Orlando Franco in the studio, Lisbon, Portugal. In 2014. Orlando Franco anb André Banha in the studio, Coruche, Portugal. In 2014. Yonamine Miguel in ZDB, Lisbon, Portugal. In 2014. Pedro Cabrita Reis in the studio, Lisbon, Portugal. In 2014. 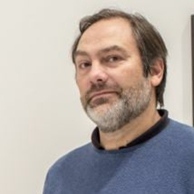 Mauro Pinto at Berardo Museum, CCB, Lisbon, Portugal. 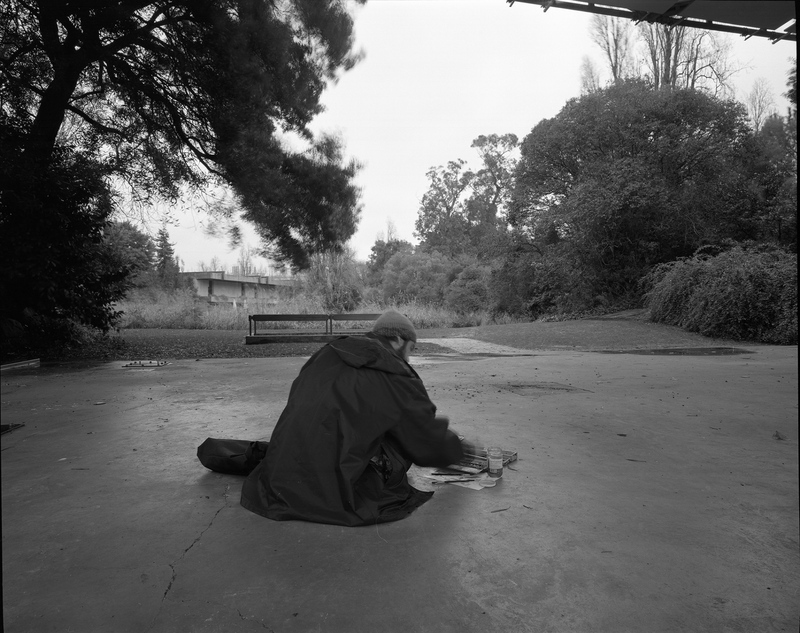 Mauro was preparing his participation on a contest NovoBanco Photo Prize, that he won with a series "Dá Licença". The exhibition design was made byJosé Forjaz. In 2014. This image was made with black and white film and Mamyia 7II camera, in 6x7 format. This numbered copied was processed in Ilford FB glossy paper, 40x50cm. 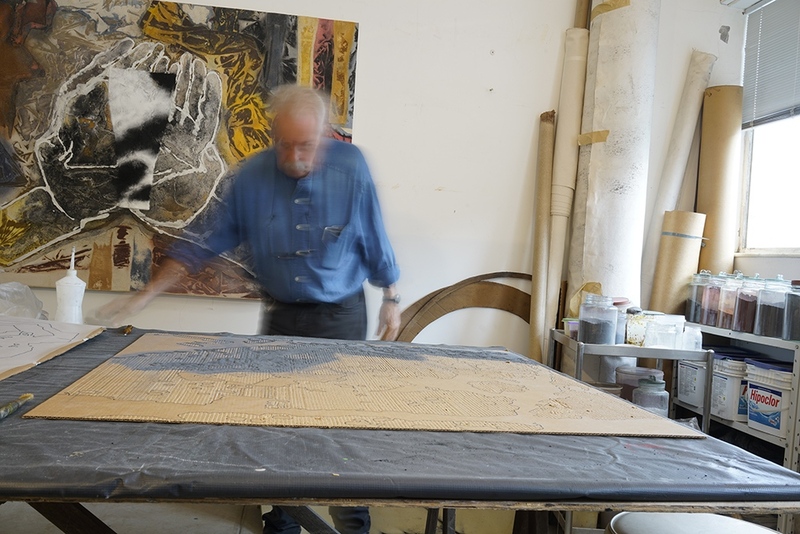 Mauro Pinto at his studio, Lisbon, Portugal. 2014. Pedro Cavalheiro in the studio, Lisbon, Portugal. In 2014. 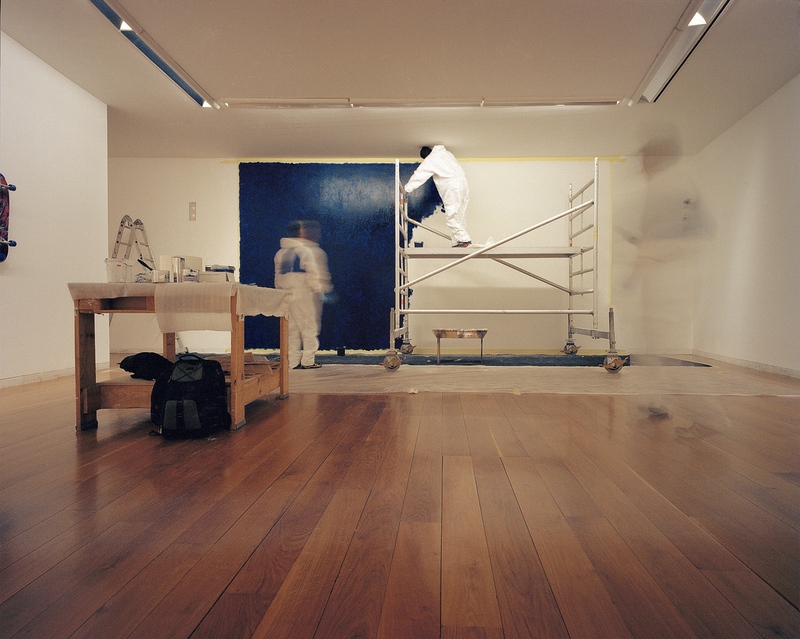 Carla Filipe at Berardo Museum, instaling a solo exhibition, Lisbon, Portugal., 2014. Carlos Gaspar painting at Gulbekian gardens, Lisbon, Portugal. In 2014. Sara Maia in the studio, Lisbon, Portugal. In 2014. 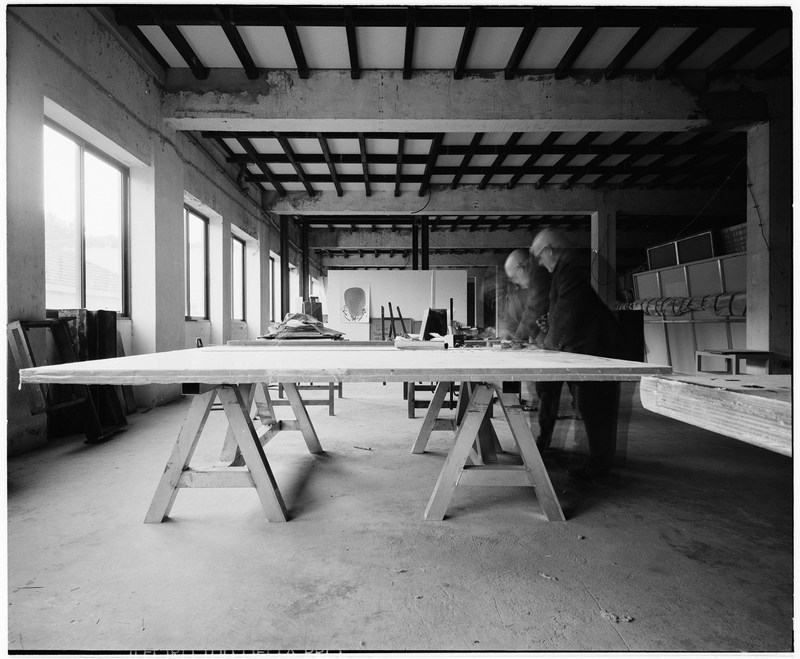 Antonio Poppe in the studio, Lisbon, Portugal. In 2014. Tatiana Macedo filming in the Chiado Museum, Lisbon, Portugal. In 2014.
embody memory, so that it substitutes the present before your eyes?" 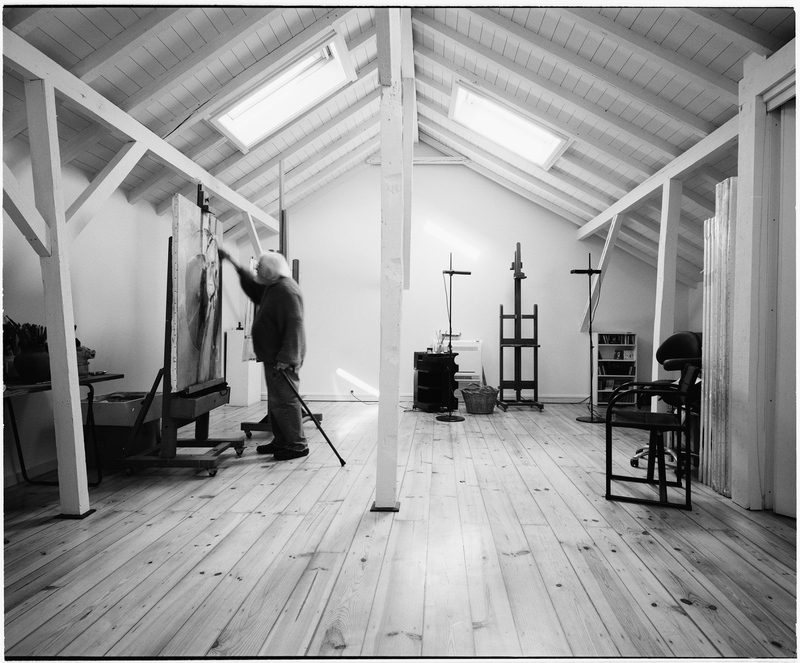 "The artist's studio is the sacred spot in the process, of the coming into being, which may or may not turn into a work of art. It is a space which the artist at times shares, and other times prefers to keep hidden from other eyes, while the work is still emerging. 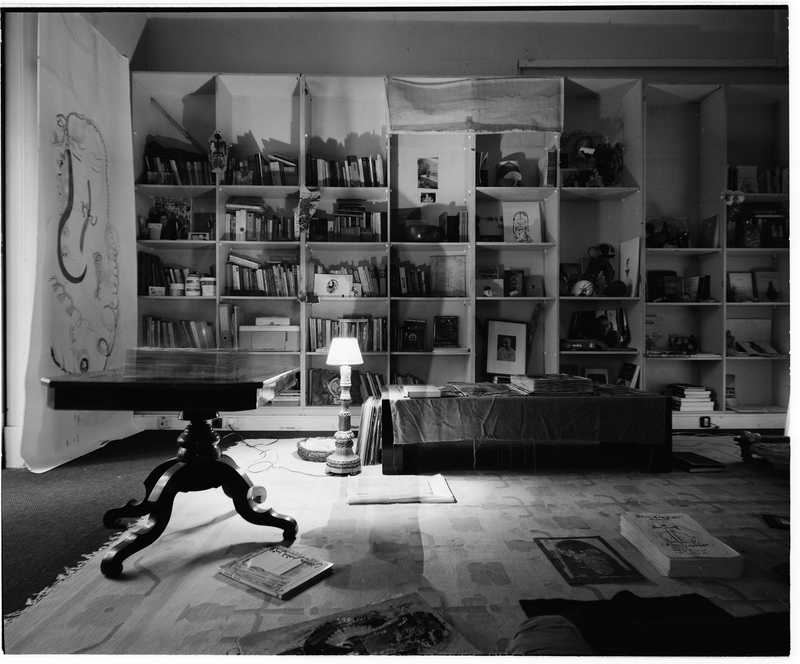 There are artists who recreate the same work throughout their whole life, and their studio acts as a portrait of their obsessions: the objects scattered to the corners, papers spread around, books, canvases and other materials, each reflecting its function in that space, which is, in the end, about creation and new beginnings. 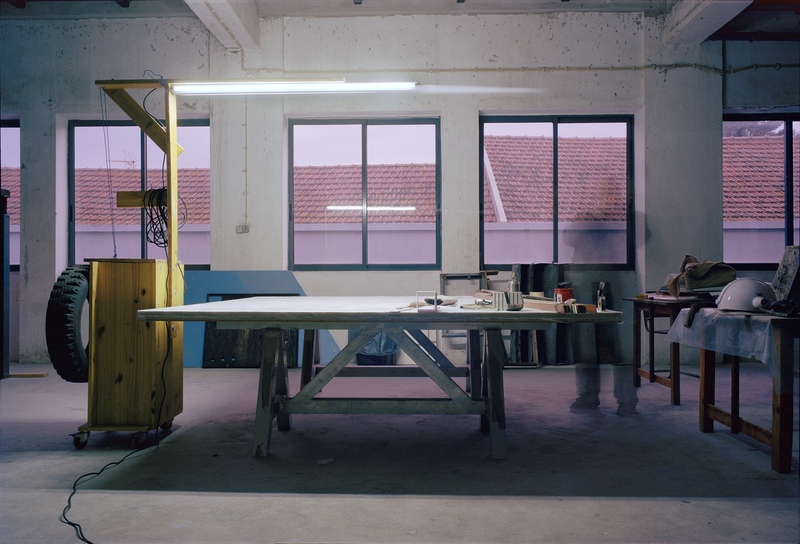 Rodrigo Bettencourt decided to freeze the moment of silence which reigns in other artists' studios, before the work of art is born. When only the potential of it is there, and it may or may not come to life. As he says himself, "I am an observer, who pretends he is not there, pretends the others are the same as me, condemned to something, though we are not sure what it is." Like the myth of Sisyphus, artist and photographer come together in a perpetual movement, always searching for something that escapes, that is invisible, but which both, in their thirst for exposure, want to reveal, to bring to light, and give life to as an object of creativity. “This work starts from the idea of the creative moment, the moment and place where the work of art is born." 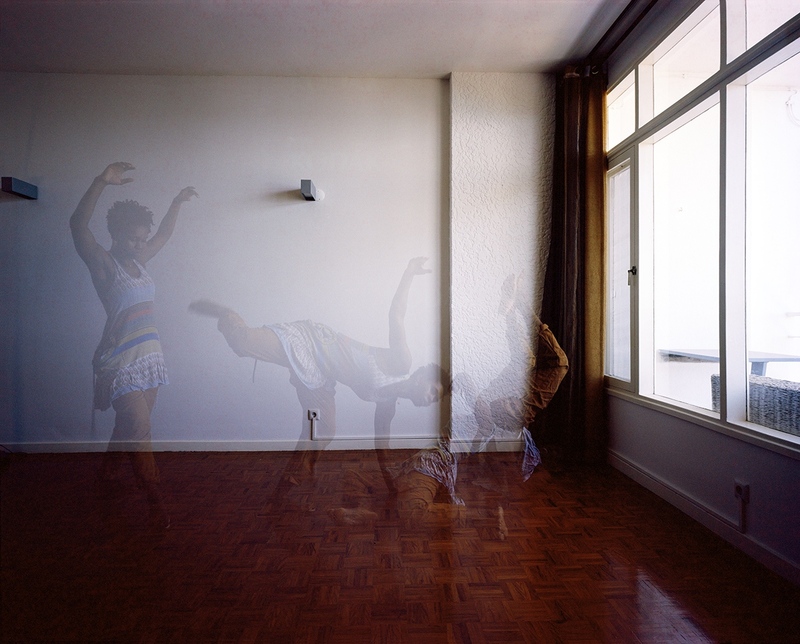 In shying away from the portrait, Rodrigo Bettencourt tries to capture the ineffable, that which does not yet exist. Which is the place where everything begins and also where the work may stay trapped for ever, if it doesn’t respond to the greater calling of bringing to light that which the artist wants to show. 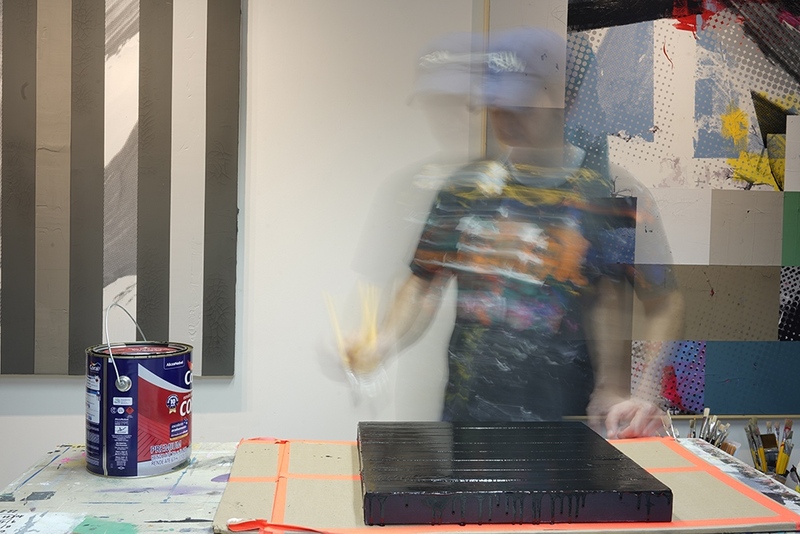 The studio is a place of learning and of production - creation connected to a gesture. 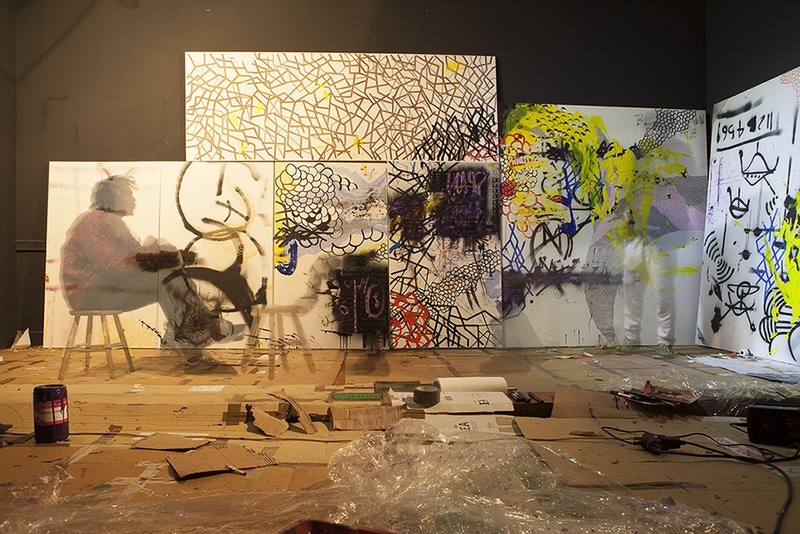 The materials appear and mingle with the works which will result from them. The photographer captures an idea, more than the space, because what we see is not represented in the photo, even though it is present in what it intends to be: a moment which lasts so that the memory of the creative gesture doesn’t fade. In the story “The Adventure of a Photographer,” Italo Calvino narrates the misfortunes of a young man in love, who tries obsessively to catch/capture his loved one. 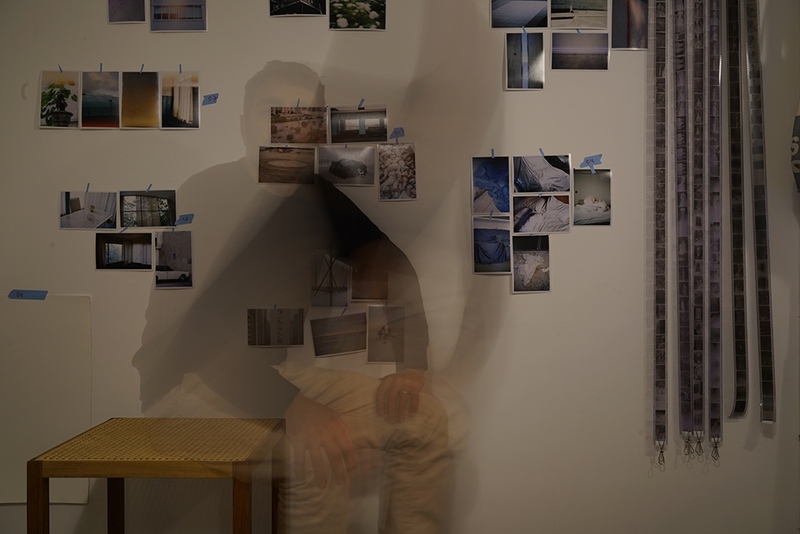 The first time she poses for him, Antonino has a revelation: "There are many possible photographs of Bice and many Bices who are impossible to photograph, but what he was seeking was the unique photograph that would contain the former and the latter." The reason Rodrigo Bettencourt chose to photograph is also multi-faceted and the vision from his camera helps us to unravel a part of these faces. The rest is that which the camera does not capture, but which the artist captures, with huge capacity for synthesis and great delicacy: that indescribable moment in the act of creation." "Rodrigo has come through many journeys and many sounds. 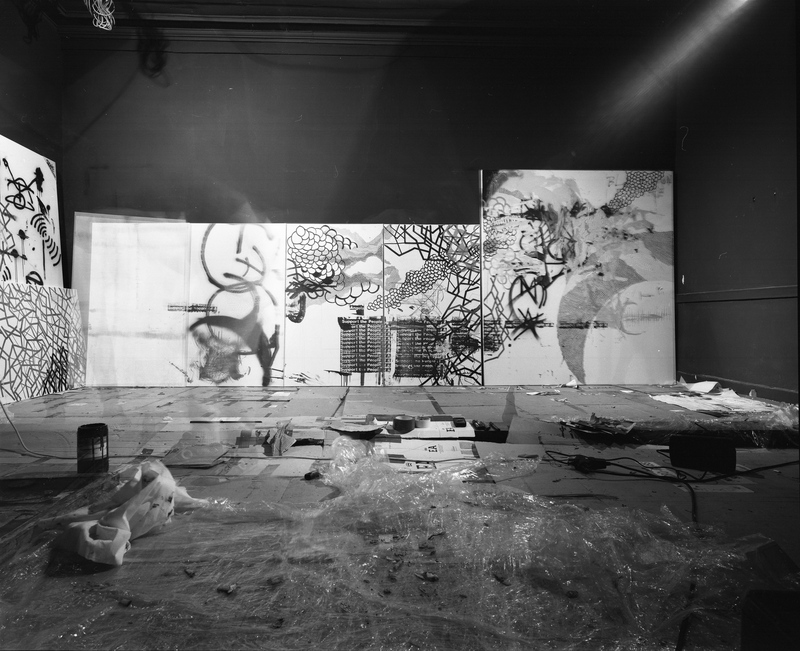 In the midst of sounds he creates and he photographs: pure, dirty, noisy art, captured raw. 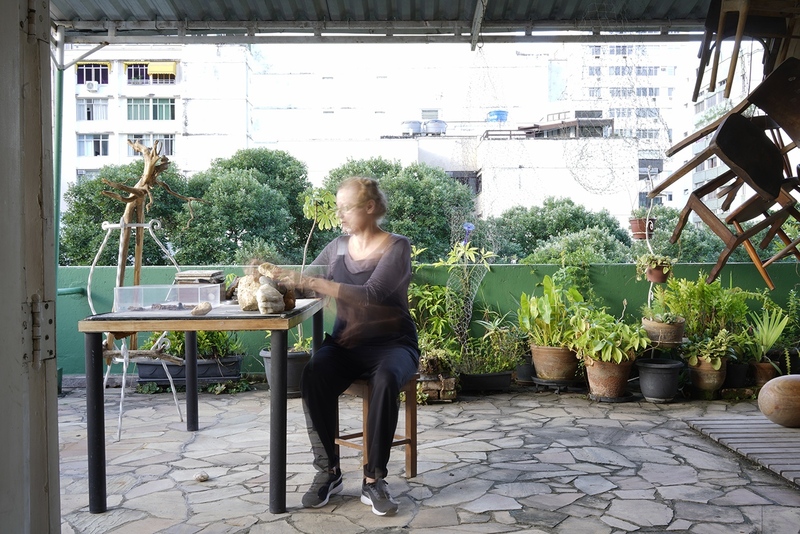 In a whirlwind of noise, with the discovery of tropical ghosts, he filled and complemented the empty space during his residency at Espaço Vazio do Largo das Artes, during the month of June this year, 2017. He took up his place there, absorbing the hospitality and that stranger's space. He kept this undefined space within him and let it grow. A strange intimacy with something unknown, which draws one in without drawing to any conclusion. From there comes the creative flow: displaying and asserting the self, as an admired presence, onto what is almost invisible. From Rodrigo's camera, there comes a new wave of the urgency of what is invisible, recreating and presenting a new world or a world anew. By means of tiny inlets of creativity, the invisible remains of the world start to assume a new, subjective, objectivity. Each one's work being created. A vision of history revised. There, were they are no longer. guided this time by its ghosts, who take the role of creative pathfinder. Fate, lost between ghosts, reveals itself mysteriously in the act of creation. as they are revealed, clearly, in the art. An eye which sees the invisible and retells history. So a new creative life is opened, with its exiled ghosts. Emerge/move in a space of creation. Vague figures...from a lost past."